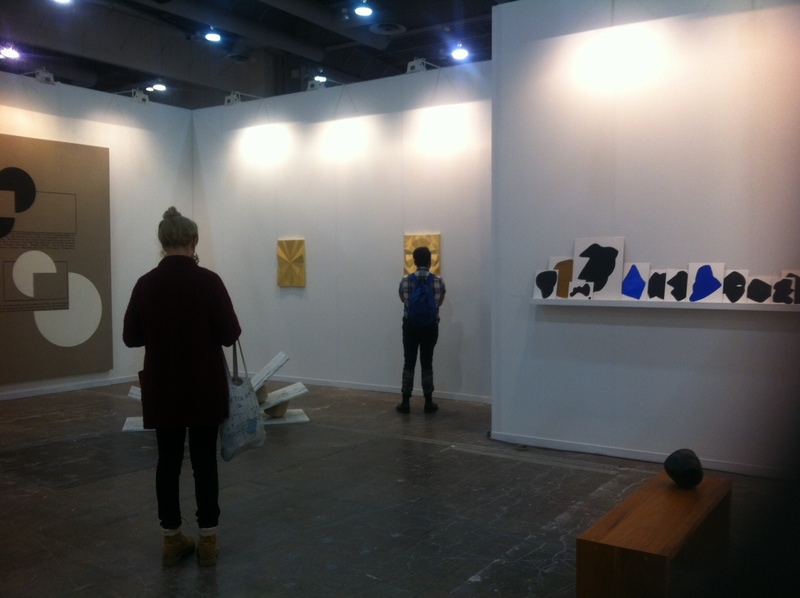 ZONA MACO, MATERIAL ART FAIR, INDEX, ET AL. 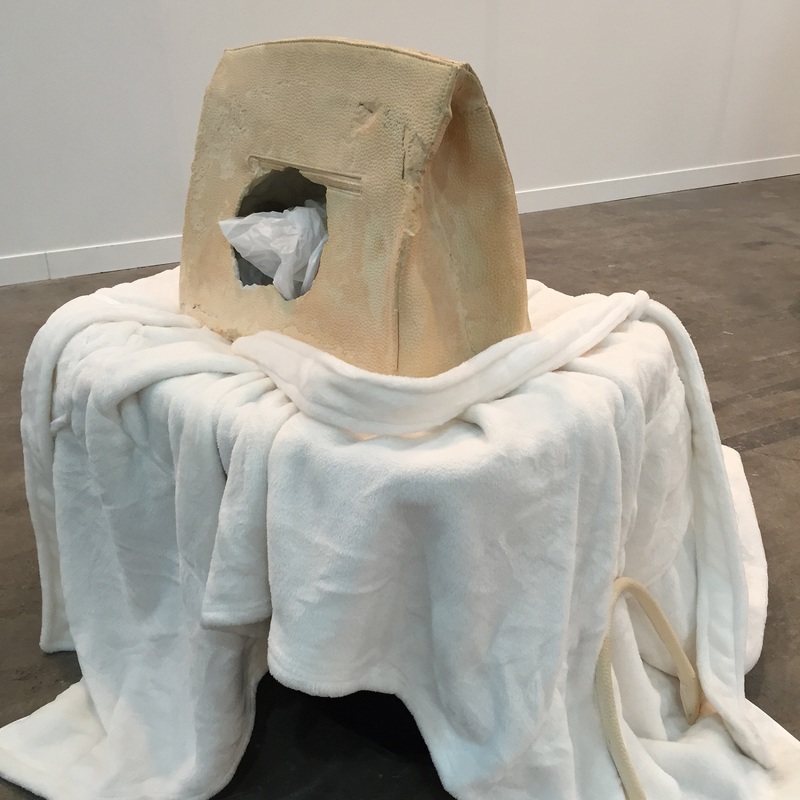 Recent editions of Mexico City art fairs Zona Maco and Material Art Fair were different this year, coming in “new and improved,” as it were, rendering plausible the oxymoron. The market exalts the visual arts in Mexico City. Overdressed neo-capitalists come in from all over after kicks and “cultural fun.” They won’t be satisfied with just any old thing, but Mexico City dazzles and delights; it retains the surrealist patina Breton described yet surges amid the chaos and modernizes under the aegis of unprecedented real-estate speculation. The city has consolidated itself as a must-do cultural-tourism destination. Or is that too pretentious? Is it a passing fancy? Doesn’t seem like it. 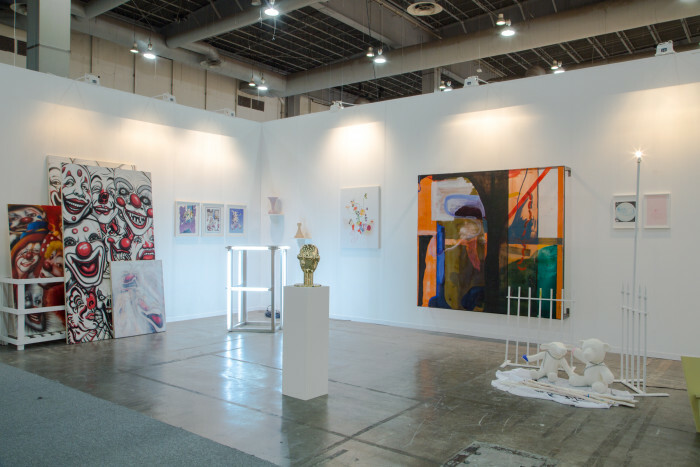 Zona Maco unveiled its thirteenth edition; Material Art Fair, now in its third year, grew and solidified in terms of participating galleries and spaces. We also had the concurrent Index Art Book Fair, given over to showcasing art- and contemporary-culture-related publishers, which ended up attracting eighty imprints from the US, Europe, Latin America and Mexico. The Index event set up shop on one level at the Museo Jumex and included a program of workshops and round-tables that attracted big crowds among those that follow the publishing world. Zona Maco introduced Daniel Garza Usabiaga as the fair’s new Artistic Director, following Pablo del Val’s exit. 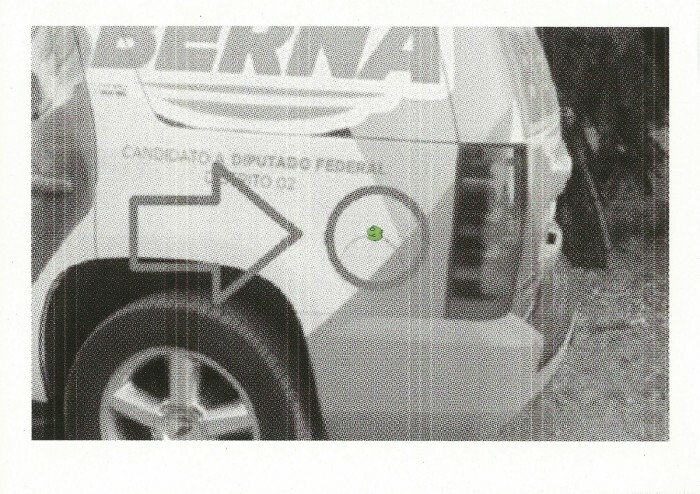 Garza-Usabiaga didn’t have too much time to put together a front-facing identity for the fair; we’ll have to wait till the next edition to more clearly see his program’s intentions. The modern art section at Maco continues to consolidate slowly; each successive edition presents better results. Gallery numbers are up (there were sixteen this time around); the offering is ever-more international and we saw some good work. 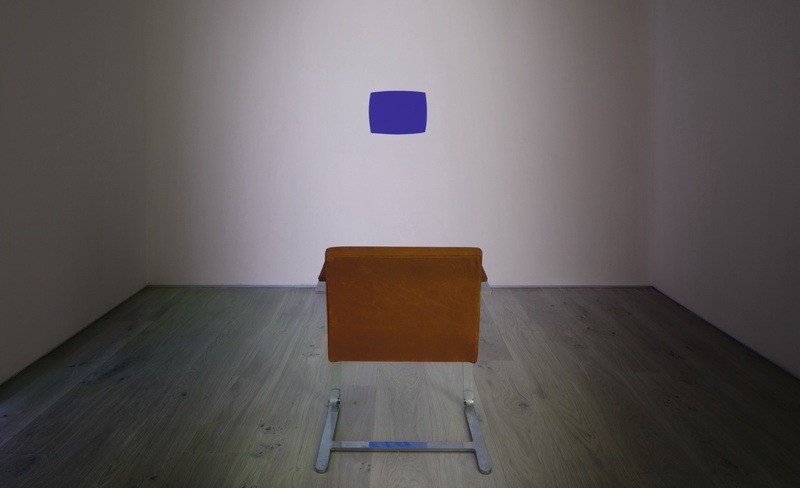 Noteworthy examples this year were Calder sculptures, presented by a number of galleries; a couple of Mathias Goeritz’ Mensajes; and some subtle, yet powerful Yves Klein sculptures. 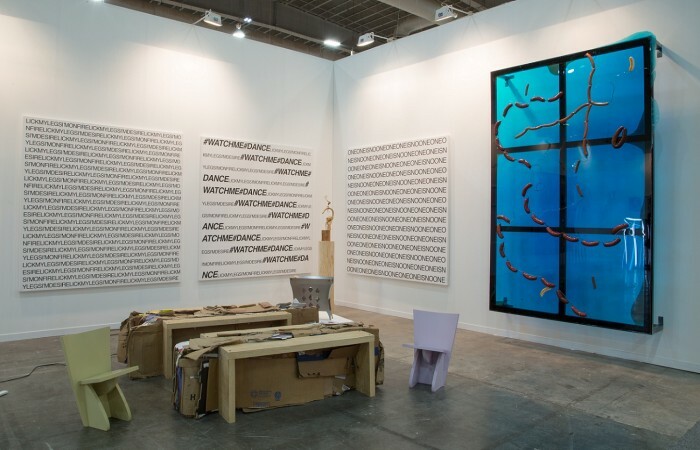 It’s interesting—surprising, ridiculous, let the reader choose the best word—to see kinetic art’s reproductive capacity at the fair; every year there are more works by Cruz-Diez, Rafael Soto, Mérida, etc., etc. The Galería de Arte Mexicano showed three oils by Joy Laville that suppose beauty resides in the rearguard. This most interesting projects this time out emerged from Zona Maco Sur, curated for the second time by Kunsthalle Lissabon co-directors Luis Silva and João Mourão, who presented twenty-one projects. At Galería de Arte Mexicano, Miguel Monroy deployed a series of documents, graphic materials, videos and models that analyzed Centro Banamex’s security systems and imagined a possible plan for robbing the venue through a tunnel. 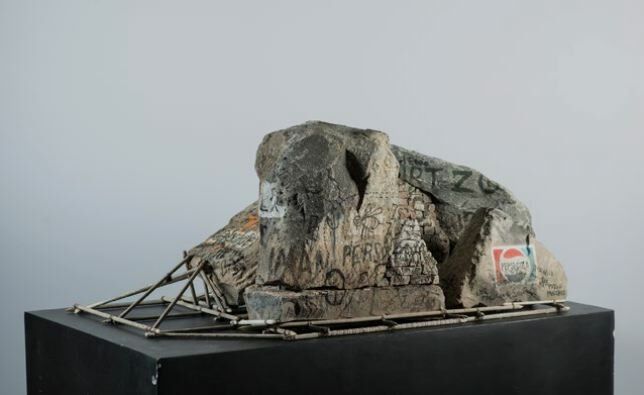 The work calls to mind not only “Chapo” Guzmán’s two jailbreaks but also a gesture on the part of Gurrola, Gelsen Gas and Arnaldo Cohen at the 1972 Documenta event, where they filmed Robarte el arte (Stealing the Art). Other standouts from this section included Federico Herrero’s paintings at Sies & Höke, large-format pieces that bear the artist’s now recognizable style: sweet colors that bring on a sense of peace. Very different are paintings by Manuel Solano at Karen Huber, fashioned of erratic strokes reminiscent of a kindergartener’s enthusiastic painting, that manage a confused figuration. 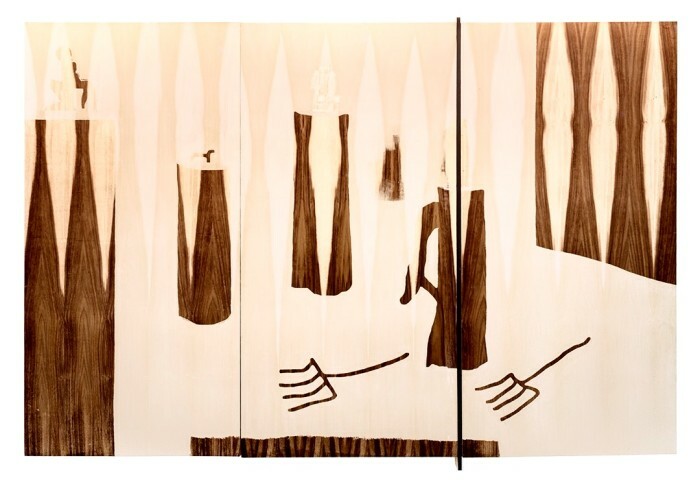 Among the fair’s numerous paintings, a large-format piece by Álvaro Castillo, shown at GAM, was exceptional, done in acrylic on wood and slowly, minimally painted over the course of three years. 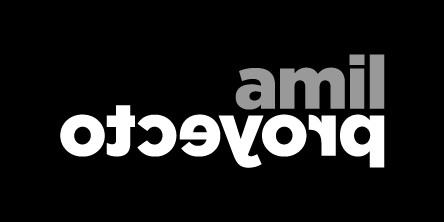 Here paint acts in an inverted sense. 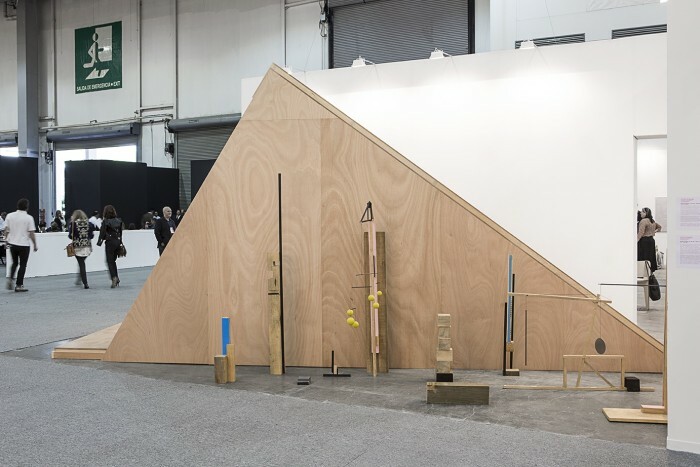 At Andréhn-Schiptjenko, Xavier Veilhan presented a series of sculptures (completed as part of a Casa Wabi residency) within a wooden structure that recalled the pyramidal volumes that surround the National University of Mexico’s famed Espacio escultórico. Quite worthy of mention was the Y Gallery booth, featuring a work by Bjorn Melhus, an installation with portraits of the artist characterized by multiple egos, plus a video the artist filmed in Mexico’s north that makes reference to drug trafficking. And how to forget Alex Hubbard’s “paintings” with their flaming colors on acrylic and plexiglass, encrusted with hot dogs? They are masterpieces that doubtless enrage as much as they delight. The way the market responds to museum programming is striking. It’s no secret the national university’s MUAC is planning a major Anish Kapoor exhibition and a number of quite divergent galleries at the fair offered works by the Indian sculptor, similar to what happened last year with Yayoi Kusama. 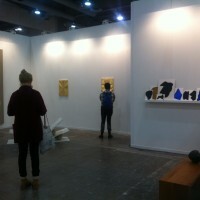 Material Art Fair presented a number of new sensations. The venue changed, from the Auditorio BlackBerry to facilities at Expo Reforma, the same spot where Maco used to happen many years ago. When Maco took place there, an incipient “B-side” fair initiative was held across the street, mockingly named ChachaMaco, that distributed emerging artists’ work in dark containers. The comparison may serve to show just how much the business of art has grown in Mexico City. Now the alternative fair occupies the physical space Maco formerly used. Material Art Fair is the party for the kids. It struck me not one of its attendees was a potential buyer, yet everyone knows appearances can deceive. The booths’ layout (as proposed by the Aprdelesp collective) was confusing and labyrinthine; I celebrate this edgy gesture that made it hard to know where one gallery began and the other ended. 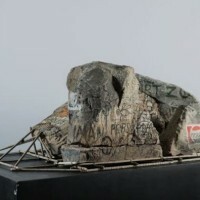 Material Art was awash in work reactionaries would call trash, full of clever gestures. It agglomerated works that share the same aesthetic, making it impossible to differentiate between this or that creator, in pieces linked to post-internet globalism and climatically represented by young artists from the west coast of the US or Berlin. On one hand, Material introduces the dissident and problematic into the Mexican cultural scene; that which comes to pass through anomaly and that, for me, represents a yet-to-be-understood power—an energy that creates chaotic, post-apocalyptic forms. At the same time, you sense the rapacious hunger of a market that converts any pure energy into a scrumptious sweetmeat for the gobbling. 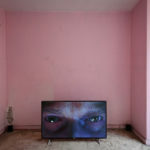 The Monster, as we know, eats all, and among all the artworks it’s hard to distinguish what will endure as a true transforming power (say, Castro reloded) from fluorescent spits that will end up adorning the residences of the one percent. 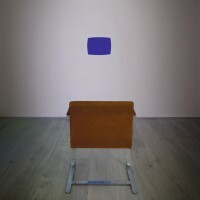 Enrique Vila Matas, in a conversation with Dominique González Foerster, said something like ‘art is one of the highest forms of existence, as long as the creator eludes a double-trap: the illusion of the artwork and the temptation of the artist’s mask. Both fossilize us. The former because it turns passion into a prison and the latter because it turns freedom into a profession’. 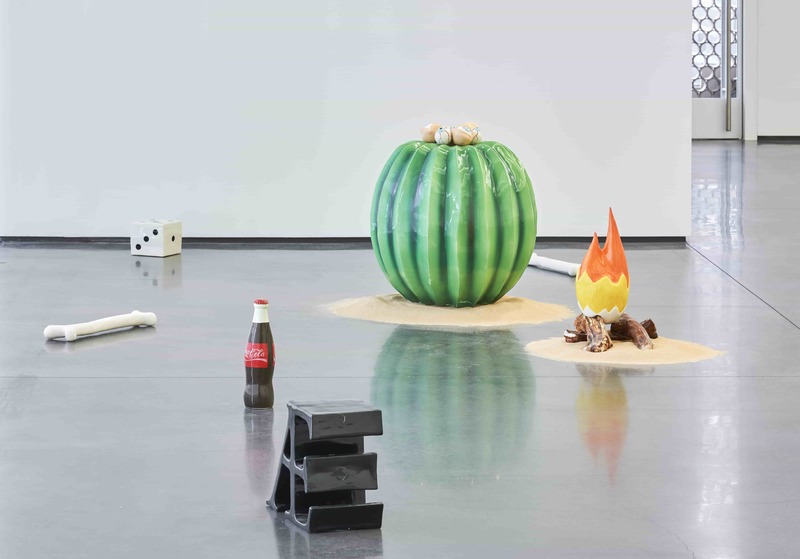 I remembered that when I went to the Taller de los Viernes show at Kurimanzutto, curated by Guillermo Santamarina, who at the opening (being the dandy he is, yet disguised as a nuclear bum) swept away the detritus of a whole generation that has come to be something even more than canonical. 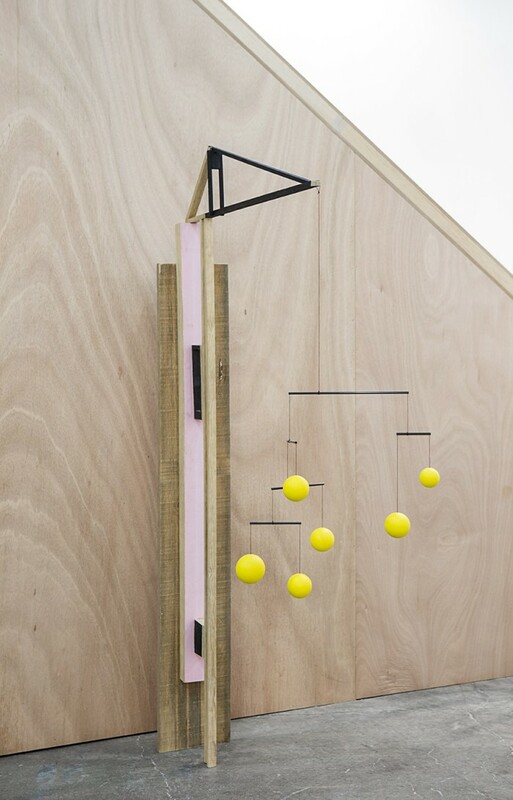 Josef Strau’s show at House of Gaga shines brilliantly from the minute you peek through the gallery window; it’s a show born of pleasure that reminds us that fear paralyzes, stuns and impedes thinking. That every body consumed is a body in flames and that every word comes from a body. My body now depressed and from it shines this light. 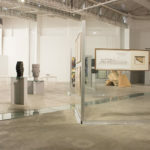 Las recientes ediciones de las ferias de arte en la ciudad de México Zona Maco y Material, fueron distintas este año, llegando “nuevas y mejoradas”, haciendo plausible ese oxímoron. Las artes visuales en la ciudad de México se exaltan por el mercado. De todas latitudes llegan emperifollados neocapitalistas en busca de novedad y “diversión cultural”. No se conforman con cualquier cosa y la Ciudad de México deslumbra y divierte; conserva aún esa pátina surrealista que describió Breton, y entre el caos crece y se moderniza bajo una especulación inmobiliaria sin precedentes. De tal modo, la ciudad se consolida como un destino turístico-cultural ineludible. ¿O será demasiada pretensión? 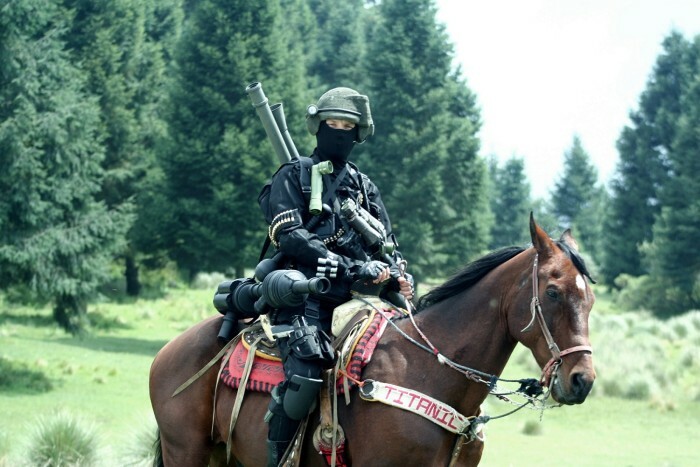 ¿Una brevísima moda? No parece. 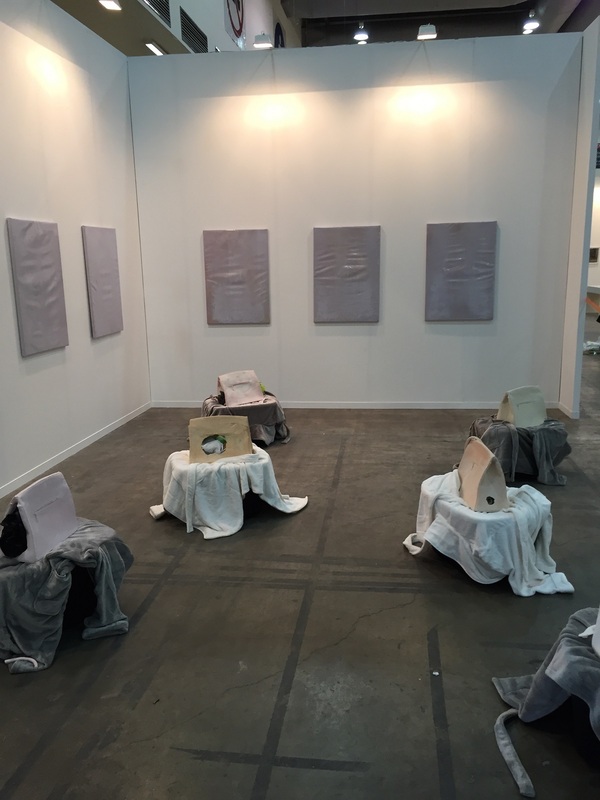 Zona Maco celebró su décimo tercera edición y Material Art Fair, en su tercer año, creció y se solidificó en número de galerías y espacios participantes. Este año, además, simultáneamente se llevó a cabo Index Art Book Fair, dedicada a presentar editoriales relacionadas con el arte y la cultura contemporánea, que consiguió reunir a 80 sellos de Estados Unidos, Europa, América Latina y México. Index ocupó una de las plantas del Museo Jumex e incluyó un programa de talleres y mesas redondas que convocaron a muchos interesados en la escena editorial. 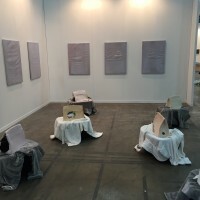 Zona Maco presentó a Daniel Garza Usabiaga como nuevo director artístico de la feria, tras la salida de Pablo del Val. Garza-Usabiaga tuvo poco tiempo para plasmar un sello distintivo al frente de la misma y habrá que esperar a la próxima edición para ver con mayor claridad el producto de su programa. La sección dedicada al arte moderno en Maco se consolida lentamente y cada edición entrega mejores resultados. Crece el número de galerías (ahora fueron 16), se internacionaliza la oferta y vemos buenas obras. Destacaron este año las esculturas de Alexander Calder, que varias galerías ofrecían, un par de mensajes de Mathias Goeritz, y una sutiles y poderosas esculturas de Yves Klein. Resulta, interesante, sorprendente, ridículo (el lector elija de las tres la mejor palabra) ver la capacidad multiplicadora que el arte cinético tiene en la feria: cada año se ofrecen más obras de Cruz-Diez, de Rafael Soto, de Mérida, etcétera. La Galería de Arte Mexicano mostró tres óleos de Joy Laville que suponen que la belleza se encuentra en la retaguardia. Lo más interesante de este año se encontraba en Zona Maco Sur, curada por segunda ocasión por los co-directores de la Kunsthalle Lissabon, Luis Silva y João Mourão, quienes presentaron 21 proyectos. En Galería de Arte Mexicano, Miguel Monroy desplegó una serie de documentos, gráficos, videos y maquetas que analizaban los sistemas de seguridad del Centro Banamex e imaginaban un posible plan para robar la feria de arte mediante un túnel. Su obra recuerda no solo a los escapes del Chapo Gúzman sino al gesto de Gurrola, Gelsen Gas y Arnaldo Cohen en la Documenta de 1972, en la que filmaron Robarte el Arte. Dentro de esta misma sección destacaron las pinturas de Federico Herrero en Sies & Hoke, cuadros de gran formato con el ya reconocible estilo del artista: colores dulces que provocan sosiego. Muy distintas, las pinturas de Manuel Solano en Karen Huber hechas con trazos erráticos recuerdan a un niño de kindergarten pintando con entusiasmo, logrando una figuración confusa. De las múltiples pinturas en la feria también destacó la de gran formato de Álvaro Castillo expuesta en la GAM, hecha con acrílico sobre madera, pintada lenta y mínimamente durante tres años, donde la pintura actúa en sentido inverso. Xavier Veilhan presentó en Andréhn-Schiptjenko una serie de esculturas dentro de una estructura de madera -hechas tras una residencia en Casa Wabi- que recuerdan a los volúmenes piramidales que rodean el espacio escultórico de la UNAM. Digno de mención también el stand de Y Gallery, con obra de Bjorn Melhus, una instalación de retratos del artista caracterizado por múltiples egos, y un video filmado por el artista en el norte del país refiriendo al tema del narcotráfico. Cómo olvidar las “pinturas” de Alex Hubbard sobre acrílicos o plexiglases de colores encendidos con salchichas incrustadas: una obra maestra que seguro enoja como encanta. Llama la atención cómo el mercado responde a las programaciones de los museos. Bien sabido es que el MUAC prepara una gran muestra de Anish Kapoor, y en la feria se ofrecían las piezas del escultor indio en muy diferentes galerías, parecido a lo que sucedió el año pasado con Yayoi Kusama. Material Art Fair presentó muchas novedades este año. Cambiaron de sede, del auditorio Black Berry a las instalaciones de Expo Reforma, mismo lugar donde muchos años atrás se hiciera, precisamente, Maco. Cuando Maco se hizo en Expo Reforma, una incipiente iniciativa de feria lado B se celebró enfrente bajo el nombre burlón de ChachaMaco y distribuyó la obra de nuevos artistas en oscuros contenedores. Sirva la comparación para palpar el crecimiento del comercio del arte en la ciudad. Ahora, la feria alternativa ha tomado el antiguo espacio físico que Maco utilizó. Material Art Fair es la fiesta de la juventud. Me pareció que ninguno de los asistentes era comprador potencial, pero ya se sabe que las apariencias engañan. La distribución de los stands (propuesta por el colectivo Aprdelesp) fue confusa y laberíntica; celebro el gesto atrevido que lograba producir el efecto de no poder distinguir donde comenzaba una galería y terminaba la otra. Material Art estuvo plagada de obra que un reaccionario calificaría de basura, de gestos ocurrentes. Aglomeró obras que gozan una misma estética, imposible también de diferenciar entre un autor y otro y que podría ligarse a la globalidad postinternet, representada climáticamente por los jóvenes artistas de la costa oeste de USA o de Berlín. Por un lado, Material introduce en la escena cultural mexicana aquello que es disidente y problemático, aquello que pasa por anomalía y que para mí representa la potencia incomprendida, una energía creadora de formas caóticas, postapocalípticas y, ¿qué le vamos a hacer si este es el mundo que le dejaron a Juanita? Al mismo tiempo se percibe la rapaz hambre del mercado que hace de cualquier energía pura un manjar a deglutir. Todo, lo sabemos, se lo comerá el gran monstruo y entre las obras, es difícil distinguir lo que se conservará como verdadera potencia transformadora (Castro reloded) de los escupitajos fluorescentes que adornarán las casas del 1 por ciento. Enrique Vila Matas, en conversación con Dominique González Foerster, dijo más o menos que el arte es una de las formas más altas de la existencia, a condición de que el creador escape a una doble trampa: la ilusión de la obra de arte y la tentación de la máscara del artista. Ambas nos fosilizan, la primera porque hace de una pasión una prisión, y la segunda porque convierte una libertad en una profesión. Recordé aquello al ver la muestra del Taller de los Viernes en la galería Kurimanzutto curada por Guillermo Santamarina, quien durante la inauguración, como dandy que es, pero disfrazado de mendigo nuclear, barrió los detritus de una generación entera que es ya más que canon. 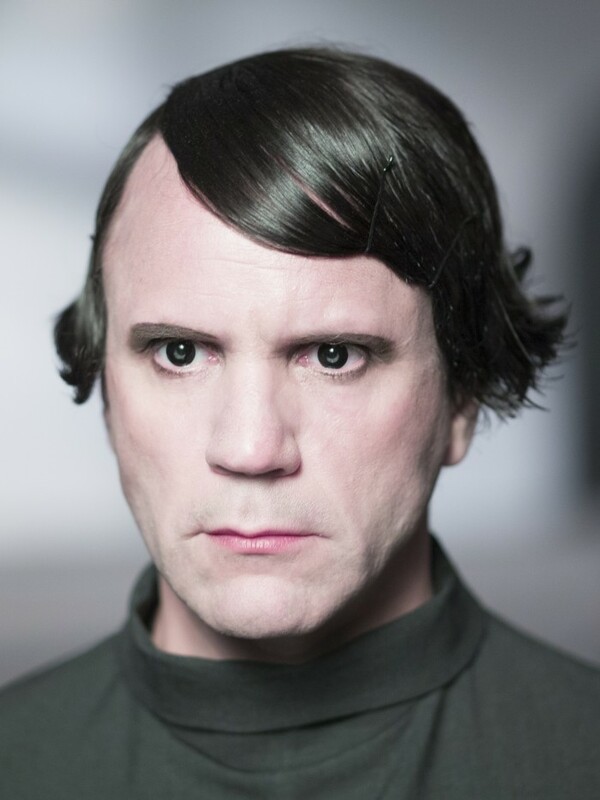 La muestra de Josef Strau en House of Gaga brilla desde que uno se asoma a la vitrina de la galería; una muestra que nace del gozo y que recuerda que el miedo paraliza, aturde, no deja pensar. Y que cada cuerpo que se consume es un cuerpo en llamas y que toda palabra proviene de un cuerpo. Mi cuerpo ahora está deprimido y de ahí sale esta luz.